We have seen large numbers of facebook posts that promise something, but it turns out to be a scam. Fb users are still believing such kind of posts and blindly following the instructions. So, Cyber criminals are keep coming up with new themes to trick users. Over the past few days, i have been receiving a facebook notifications informing that one of my friends mentioned me in a comment. I had a look at the post, it is none other than a facebook scam. 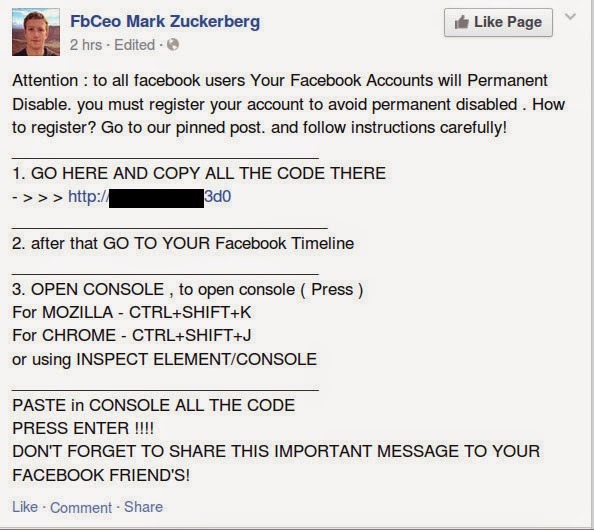 The scam posts says "to all facebook users Your Facebook Accounts will Permanent Disable. you must register your account to avoid permanent disabled . How to register? Go to our pinned post. and follow instructions carefully!" It asks you to copy and paste some code in the console of your browser. By blindly following the instructions of scammers, users are allowing scammers to do various actions('like', 'sharing', 'tagging friends' and more) on their behalf. Earlier this year, we learned that scammers were tricking users by promising them that following the instructions will help them to hack their friends' accounts.